Collins Booksellers - Life without Glasses by Robert K. Maloney, MD, 9781943886296. Buy this book online. 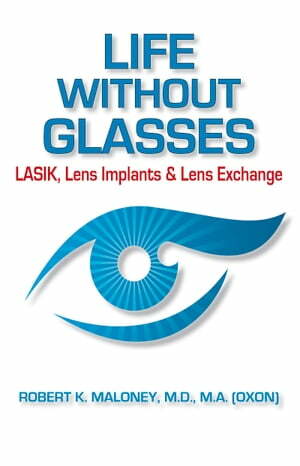 Nearly 3.6 million Americans have their vision surgically corrected annually; it is the most commonly performed surgery in the nation. Even so, many people find themselves feeling anxious about the procedure. Author Robert K. Maloney is an experienced ophthalmologist who has performed thousands of vision correction surgeries. Not only is he an expert at performing these surgeries, he is a compassionate physician who understands the kinds of questions and concerns people have. In this book he covers LASIK and PRK surgeries, the differences between RLE and ICL, the implantable contact lens, refractive lens exchanges, how to choose a surgeon, and the newest vision correction surgery techniques.